Bath & Body Works CocoShea Coconut Whipped Body Butter 8 Oz. Bath & Body Works Coco Shea Coconut Intense Moisture Whipped Body Butter 8 Oz. CocoShea blends two of nature's most nourishing ingredients - vitamin-packed cocoa butter + rich, moisturizing shea butter - for the ultimate collection of skin-loving formulas. With over 24 hours of super rich hydration, our deeply nourishing whipped body butter delivers intense moisture to leave skin feeling moisturized and richly replenished. 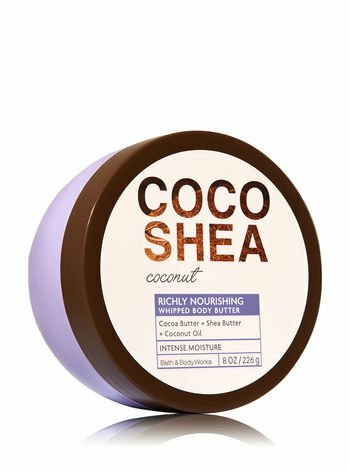 CocoShea blends two of nature's most nourishing ingredients - vitamin-packed cocoa butter + rich, moisturizing shea butter - for the ultimate collection of skin-loving formulas. With over 24 hours of super rich hydration, our deeply nourishing whipped body butter delivers intense moisture to leave skin feeling moisturized and richly replenished.